Working on the sewer system is like making sausage. No one wants to know how it works. They just want a good product when it’s finished. The city of Shreveport is working on making our sewer system better, by repairing or replacing underground sewer lines all over the city. This work is being done as part of the federallymandated consent decree and will eventually result in improved sewer service and cleaner water in our creeks, bayous and rivers. The program is called Clean Water Shreveport, and through it the city of Shreveport is changing the lives of locals for the better, and training people with knowledge and skills that will stay here in our community after the program is completed. 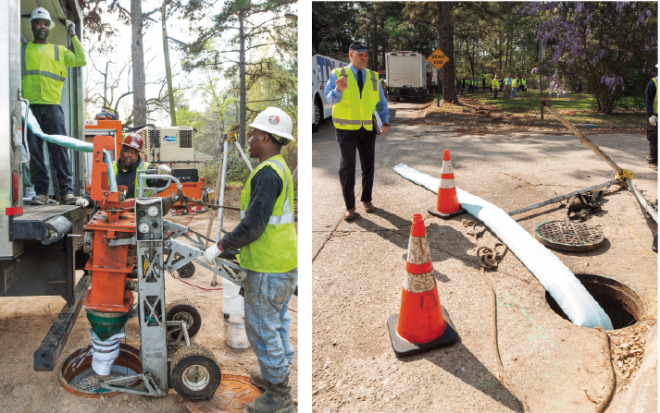 As part of this program, the city Department of Engineering & Environmental Services, in conjunction with the Department of Water and Sewerage, is about to become one of the largest users in the nation of an innovative technique called trenchless technology. Because of this, millions are being saved, and the process is much faster and less disruptive for citizens. And local contractors are learning skills that will allow them to compete regionally and even nationally in the future. Jerrick Hall, project consultant manager with Hall Builders, is a construction manager and residential project representative for the Clean Water Shreveport Program team, led by the city of Shreveport and CDM Smith. 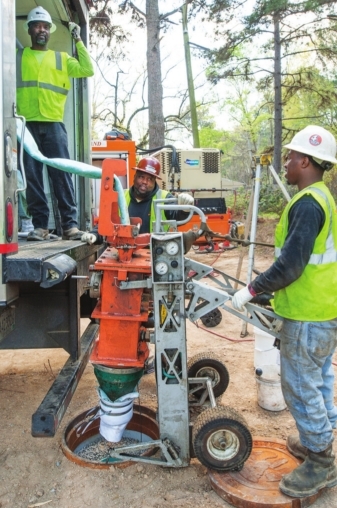 Hall had heard about trenchless technology in college (he has a master’s degree in construction engineering from the University of Alabama) but had never seen it firsthand. When he joined the Clean Water Shreveport team, he was determined to prove that Hall Builders has competent, good people who can perform and progress in multimillion dollar programs. When Cured In Place Pipe Lining (CIPPL) – one form of trenchless technology – was being considered to save time and money for the city, Hall knew he wanted to learn more. So he observed the technology at Suncoast Contracting in Mississippi, then went to Williamsburg, Va., to attend an Inspectors’ Training Certification Program for CIPP. The city of Shreveport has committed to installing this liner, and Hall committed to ensuring the city would continue to receive a quality product. Hall paid for the trips and the certification program with his own money. As he says, “My family upbringing taught me to continue to seek excellence.” His father, Rickey Hall, is the CEO of Hall Builders. One of the elements of the course was learning to write specifications for CIPPL. If specs aren’t written correctly, the city might get a low bidder but a poorer product. As a result, Hall is now helping develop more precise specifications for the city. And his training has made him a more thorough inspector. Now Hall has an opportunity to become a teacher for the certifications, which gives the city of Shreveport an opportunity to use local firms to train local people. And as a local contractor, the expertise he’s learned will stay in Shreveport long after the Clean Water Shreveport Program has been completed. Jerrick Hall and Hall Builders are just one more example of growing the city’s local firms to compete not just locally but regionally and nationally.